The last three Open champions have all been in their 40s. How Jim Furyk would love to extend that streak into a fourth year. He has a chance, too, sitting in a tie for ninth on five-under-par at the halfway stage. At 44, every single player in front of him is younger but Furyk is counting on his superior bank of to help pull him over the finishing line towards the Claret Jug. “I think experience matters in any major,” said the 2003 US Open champion. “I’m 44 and, the last three years, I’ve had quite a few opportunities in the majors and been in the hunt. 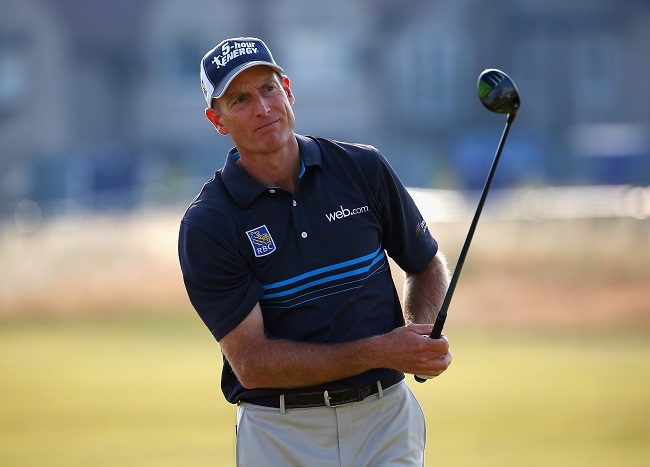 This is Furyk’s 18th Open Championship and he has finished fourth or tied fourth on three separate occasions: in 1997, 1998 and, here, at Royal Liverpool, in 2006. He insists that this type of golf suits him now – even if it didn’t always. “Links golf is a different animal, a different breed,” said the American. “My first go at it was the Scottish Open in 1996 at Carnoustie and I got abused by it. I missed the cut by probably 14 or 20 shots but it was good to get that experience because I ended up making the cut at Royal Lytham in the Open that year. “Although I probably finished 40th or something, at least I got my feet wet and started understanding it. Then I played well the next year and finished fourth. Keep up-to-date with all the latest goings with Jim Furyk & C0, and the rest of the field from the 2014 Open Championship direct from the bunkered team. Follow us on Twitter (@BunkeredOnline) and Facebook (facebook.com/BunkeredMagazine).